Inspire Magazine speaks to Prof Abderrezak Djerrab, a professor at the University of Guelma and part of a multidisciplinary research team working in the areas including geophysics, palaeontology, typology and mineralogy. 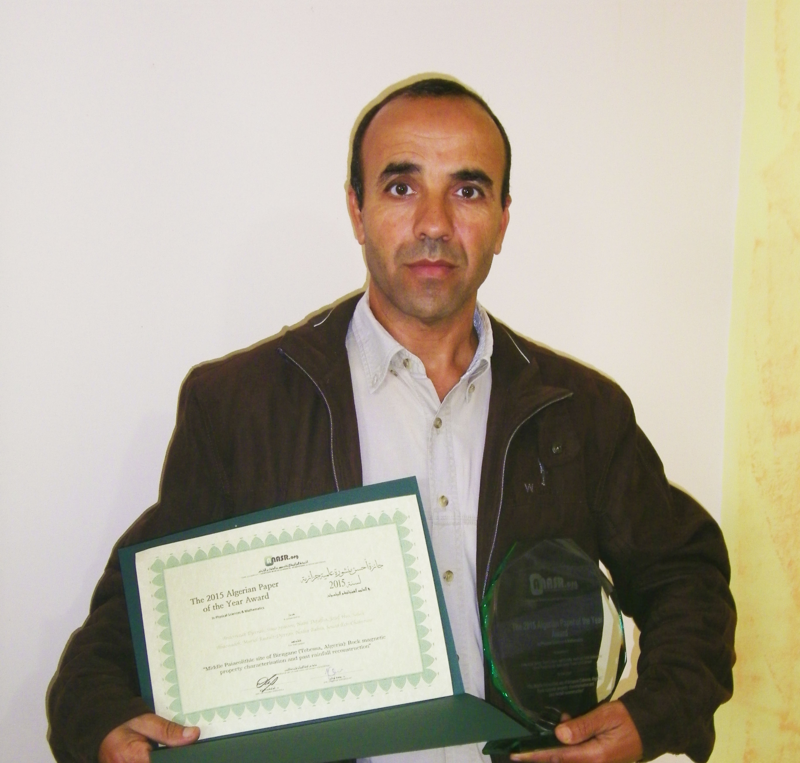 Prof Djerrab is the lead author of the paper “The Middle Palaeolithic site of Birzgane (Tebessa, Algeria): Rock magnetic property characterisation and past rainfall reconstruction”, which won the 2015 Algerian Paper of the Year Award in Physical Sciences & Mathematics. Inspire Magazine: Thank you for speaking to Inspire Magazine, and many congratulations for winning the 2015 Algerian Paper of the Year Award in Biological Sciences. How do you feel about winning this award? Abderrezak Djerrab: Many thanks to the Algerian Network for Academics, Scientists and Researchers for this award and for all the efforts undertaking by its members to promote scientific research in Algeria. Thank you also for disseminating our work nationally and internationally. I would like to thank everyone who helped in realising this piece of research, firstly the research team at the ‘Centre de Physique du Globe’ de l’IRM in Belgium, who ensured that the magnetic analyses were realised to the best of conditions. I would also like to thank my co-authors for the team work as well as the universities of Tébessa Guelma and Constantine. IM: Can you tell us what your award winning paper is about in simple terms? AD: We have been working for over ten years in quaternary terrains in the eastern region of Algeria. The research presented in this paper is part of our efforts to understand the lifestyle and paleoenvironment in which prehistoric man lived in during the Middle Palaeolithic period. The Quaternary period is the most recent one in the history of our planet, and it is characterized in particular by the appearance of the human being and also a important climatic upheavals that caused drastic modifications of the environment, for example the succession of glacial and interglacial periods. Consequently, the study of the Quaternary period is particularly interesting and allows us to reconstitute the palaeoclimate, and thus the palaeoenvironment and the lifestyle of the prehistoric men. To obtain such results, we typically use numerous methods of study jointly used by various specialists, with the aim of refining for example the magnetic methods, which are detailed in our paper, as well as other methods from sedimentology and paleontology and so on. IM: What is the exact contribution(s) of the paper to your field of research and how does it compare to other approaches that exist in the literature? AD: This work allowed to clear up several unsettled questions, as the aged-related problem of the aterian civilization, which is the name given to a Middle Paleolithic civilization in North Africa – which is by the way the name given in reference to the Algerian city of Bir el Ater. The radiometric datings realized within the framework of this work allowed us to determine that this civilization is actually older than previously thought, namely that the obtained ages are close to 120 000 years B.P., compared to the much younger age of 60 000 B.P. obtained by previous studies. These older ages are coherent with those obtained recently for comparable levels identified in Morocco by a mixed team of Moroccan and British researchers from the University of Oxford. This work also allowed us to determine the living environment of these aterian people, as well as the climatic variations recorded in sediments. IM: What kind of support, if any, have you received to help you accomplish this work? AD: The success of this particular piece of research was due to the joint efforts of various universities and institutions, in terms of human, material and financial support. These include the universities of Guelma, Tebessa and Constantine in Algeria, as well as the National Natural History Museum of Paris and the Institut de Physique du Globe of Dourbes in Belgium. IM: How did you get into this particular research and where does it fit in relation to other work conducted in your research lab or institution? AD: While preparing my PhD Thesis at the University of Perpignan in France around 1990, I had the opportunity to study some famous prehistoric sites in a number of countries, includingFrance, Italy, Spain, Turkey, Ethiopia. This was part of a series researches missions led together by the National Natural History Museum of Paris. These visits allowed me to strengthen the links between the geophysics methods – in this particular case the magnetic methods – and research in the field of prehistory, with the aim of dating and/or defining palaeoenvironments. When I returned in Algeria, in the early 2000s, it was quite naturally for me to continue to pursue my research interests in the same domain of study, and to share my experience with fellow colleagues. The research team to which I belong includes specialists of diverse disciplines, with whom I collaborate closely. I frequently look for collaborations with experts from other disciplines in other universities in diverse regions of Algeria and abroad. IM: What is your take on the state of this type of research in Algeria? And how do you see it progressing in the future? AD: At the moment, the type of research is not very well known in Algeria, although young researchers are beginning to be interested in it. There are plan to create an association to group together Algerian “quaternarists”, a number of similar associations already exist, for example, in Tunisia and Morocco. Such an association would allow to promote this field of research and to increase collaborations and cooperation between researchers and official institutions, which could even lead to develop cultural tourism, which is lacking in Algeria. In the near future, we intend to open excavation sites to increase our knowledge of this fascinating period of the human history, and so enrich our collections, which will eventually end up in museums. IM: Thank you again for speaking to Inspire Magazine, and all the best for your future endeavours. AD: Thanks to Inspire Magazine and the people behind it, I wish you all the best.